I love making dishcloths. There’s something so appealing, after going through the months-long process of making and piecing an afghan together, to just start a project and finish it up within a few hours. Hence, my many dishcloths. I’m a little picky when it comes to them, though, because I’ve decided that I don’t really prefer dishcloths with a lot of big holes. I like more of a solid fabric, but I also like a little bit of character to it as well. So this one, with bright contrasting zigzag colors, yet a generally solid surface is perfect. This dishcloth pattern looks complicated, but it’s incredibly simple – and great for beginning and experienced crocheters alike. It’s basically just one stitch (a V-stitch) over and over again. Weaving in all the ends is a drag, I’ll admit, but I save them for the end of the night when the kids are in bed, and then put a good show on Netflix and weave them all in then. It takes the monotony out of it. 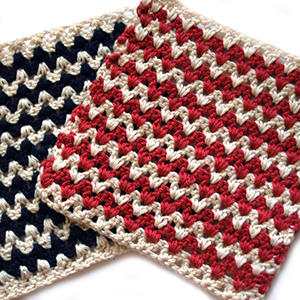 So here you are, enjoy this free crochet dishcloth pattern! To make this, I used a G (4.25mm) hook and worsted-weight cotton yarn. Row 1: dc in 6th chain from hook. Chain 1, dc in the same stitch (V-stitch made). Skip 2, V-stitch in next. Continue across. In last stitch, make 1 dc. Finish off. Do not turn. Rows 3-15: Repeat row 2. Finish off. Weave in ends. Oh, and also, I’ve finally added a newsletter box over in the sidebar! So if you’d like to get updates and notifications by email for my blog, just type in your email address and you’ll start receiving them. Love these!! I’m going to try them out tomorrow :) trying to get a jump start on Christmas gifts! Thanks for sharing! How generous of you to share this amazing pattern. Just might have to have my nieces send you a ‘thank you’ for the Christmas gift they are going to get! Thank you so very much. This is lovely! Thanks for the pattern! I’m wondering how I might turn this into a hat. Like start a normal crown with dc and then start the v-stitch? Any advice? Thanks so much! Hmmm, I’m sure it can be done. If you start with a normal crown, then at the point where you’d switch I would just make sure that the stitches are divisible by three (one for the v-stitch, and two to skip). Then for the beginning round, just take it from there. The only thing I can foresee is that the Vs would be upside down. Let me know what you come up, I’ll brainstorm on this some more! Do you think that these washcloths would make cute baby gift? If so what pattern would you use? Thanks But where do you get mercerized cotton. When I search all I get is thread. BTW which pattern would you use for a baby? I’m fairly new to crocheting and I may be about to ask a stupid question, but how do I crochet backwards? It says not too turn so I’m not sure how to make that work. That makes a ton of sense. I feel silly for having asked LOL! Yes! The ends are the one downfall of the pattern. Weave them in however you’re used to. Hello, how are you? Please, you can tell me how to make traingle of bahrain flag by crochet ? Thank you for the lovely patterns! I love your dish cloth. I am so new to this can you help me please. How do you end the row. Is there a tutorial I can watch on how to make this dishcloth ? Thanks for sharing your pattern. Sorry this has taken me so long to get back to you! Usually with crochet, you don’t want knots, but I usually make a small knot at the end. I will cut the yarn (leaving a long 6″ tail to weave in later) before pulling the final loop through, and then pull the yarn up through the center of that loop, and then pull tight. Does that make sense? Let me know, if not I’ll try to find a video description. OMG…Can’t believe my luck.Love the pattern. Will try it out this weekend! Hi, I am from Papua New Guinea, the largest island nation in the Pacific. Woman in my country make handbags (what we call “bilums”) out of woven plant fiber or colored yarns(in modern days). Current fashion trend is using this pattern to crochet simple hobo-styled bags. I’ve been attempting to crochet one myself but the pattern was too complicated for me to grasp when I started crocheting last year.That’s why I was really excited when I stumbled unto your pattern while googling diaginal box patterns. Can’t wait to start my hobo bag project. Im still confused about not turning. Sorry, beginner here! So, will all my tails end up on the same end? Thanks so much for the free pattern. I really like it. So kind of you to share. I was wondering if you have any knowledge of the type of yarn used to make potscrubbers. A friend of mine, since deceased, used to make the greatest pot scrubbers. They were circular and I think just single crochet in a circle. The yarn used was scratchy like in a pot scrubber or chore boy. She made dozens and gave them for gifts. I have been looking to the material used to no avail. There are patterns for homemade plarn, but these were in brown, blue and gray. Any ideas? Hi Barb! I’m not sure what kind of yarn your friend might have used. I’ve always heard that cotton was the best choice because it’s easy to clean, and absorbs water well. But I tried to look around and see what I could find out for you. From what I could find, there used to be a scratchy type yarn that was sold at craft stores like Joann’s several years ago but has since been discontinued. The best alternative that I could find would be to cut up plastic netting into long strips and either crochet with that, or for more bulk, you could crochet netting with cotton together. Good luck! I saw some of the scrubber “yarn” at Joanne Fabrics today. I would think it might hurt your hands to crochet a scrubbie, though. can you show a picture of the back of the discloth? does it look the same as the front due to not turning? Hi Kristine – yes, the back of the dishcloth is identical to the front. How did u make the edges so neat? I try to make the edges as even as I can when I weave in the ends, pulling a little tighter here and there where needed until they are mostly straight. I was looking for an easy pattern to crochet dishclothes and came across yours. We have a knitting ministry at my church called Hands of Hope in which we do knitting and crocheting projects for the less fortunate in our town. We also have plans to do welcome to your new home gifts for those in the congregation who move, baby blankets for the expectant moms in church and also shelters and lap blankets for the elderly in nursing and old age homes. The young girls in our church have really taken a liking to this activity. Would you mind if I shared your “Favourite and ZigZag” dishcloth patterns with the ladies? Thank you in return and have a blessed day. By all means, feel free to share any of my patterns with your group. I’m glad that they’ll warm someone’s home. 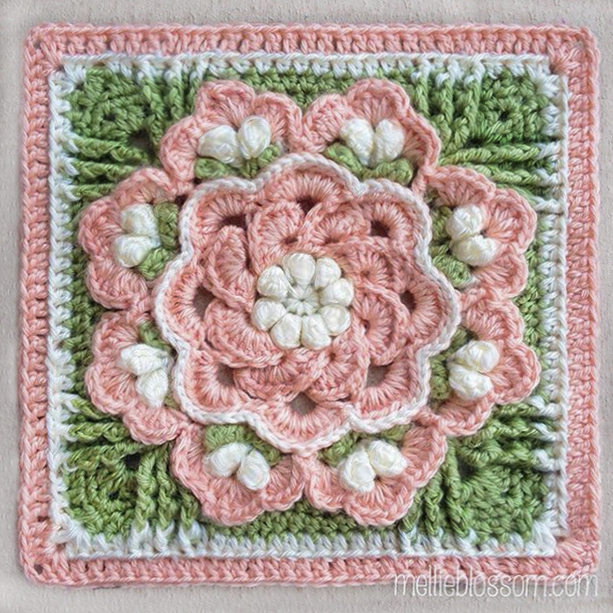 What’s up,I log on to your new stuff named “Free Crochet Dishcloth Pattern – ZigZag – mellie blossom” like every week.Your story-telling style is awesome, keep up the good work! And you can look our website about love spell.